"When you see that old man walking a little bent, just think he was once a proud young matloe [the nickname for a sailor] swinging along, head held high. When you sit next to him in church and see tears in his eyes when he sings “oh hear us when we pray to thee, for those in peril on the sea” – his thoughts go out to the night he was torpedoed and still hears those cries for help – he survived, but he will always remember those cries. The man down the road who tells you about his army days ay “Cassino” and the day he went back to the scene of the “battle” [otherwise known as the Battle of Rome, 1944] many years later – he remembers the shattered monastery rebuilt, how lovely it looks, how peaceful; now the organ playing; a place for prayer and outside just the song of the birds. He looks around at the hills and sees the Polish cemetery now so serene and peaceful and then he goes down the hill and sees the German cemetery – he says a prayer for them. They were only lads like himself doing their duty for their country. Then on to the British and Commonwealth cemetery where he sees a headstone that bears a name he knows. He stops to says ‘hello’ and on and on to see many more names and thinks what a lovely cemetery this is, we have done these boys proud – but with tears in his eyes – he thinks of his son and daughter, his grandchildren and then of the families of those boys and what might have been. Perhaps, when you are walking the dog near that old airfield, you saw a man standing looking at the old ‘dispersal bay’ and then towards the old billets, now derelict. He thinks to himself ‘that was once my home’; he thinks of the good times and the sad times and of the empty beds (usually seven); he looks towards the control tower and can still hear the WAAFs voice calling them home. Now his eyes look to the skies, he is thinking of his old “Lanc” can hear the sound of the Merlins and a feeling of tense fear and excitement runs though his body – he is now on his way to Germany and now back again, sitting down to hot tea, egg and bacon. But he thinks of the last night he saw the dispersal bay – the night he lost six of his best friends. The target was Karlsruhe. One moment they were a crew – a team – and then fate stepped in and the Lancaster was just a ball of fire hurtling earthwards. He still can’t believe how, with his parachute still intact, he was thrown into the air. He is now thinking how lucky he was to be a P.O.W. as now he can come back and look at the old airfield, but now his thoughts go back again to Germany and the boys in that row of graves, and although he had known them only a short time, what a privilege it was to claim them as friends. Let’s also think of the S.O.E. agents [Special Operations Executive], Odette, Violette Szabo and many more, the Special Duties Squadrons that took them into enemy territory. Theirs was a very silent war and so often forgotten. As we remember of servicemen let’s not forget the man down the road. When asked what he did, he says “well, I was a firemen”: he didn’t tell you of the days and nights he spent away from home, fire-fighting in London, Portsmouth, Coventry etc. – the smell of death, the bombs still falling; the same goes for so many more unsung heroes who gave so much – the police, ARP, Home Guard, WVS, nurses, doctors, ambulance crews, Salvation Army, Church Army, the clergy, all transport workers, munitions, parachute and clothing workers, the Land Army and so many more. Let us also not forget the brave Merchant Seamen, the evacuees and those who took them in – so many brave people, so many more names. Not forgetting the people who were bombed out of their homes but still kept cheerful, the people who took them in, the refugees from Europe. 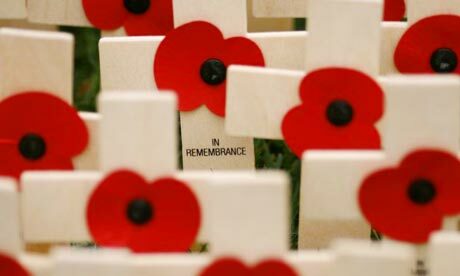 At remembrance time let us think of those men and women of all wars, past and present, the people maimed by war and still suffering to this day. Think of the widows and families, especially those too old to visit the graves of their loved ones. Also think of those people who work for the Commonwealth War Graves Commission who tend those graves so lovingly. This piece was written in the 1980s by Ricky Dyson and his wife Mavis. Ricky was a rear-gunner on the Lancaster Bombers during the Second World War, and was one of a very few who survived. He was decorated with the George Cross for his bravery. Ricky died some time after writing this piece, though Mavis is still a member of our church family. Ricky was a true hero of the War, and I dedicate this post to him, his friends, and all the fallen in our World Wars. I think the word you're searching for is 'matelot', not 'matloe'. French for sailor, but used idiomatically in England. Noel Coward wrote a song, 'Matelot'. You'll find it on Youtube. Apart from that, good post.